Pick Me! 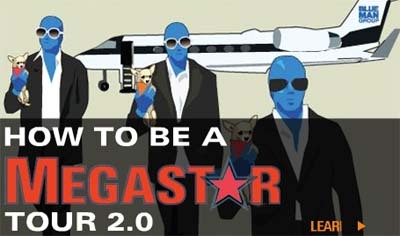 » Blue Man Group On Tour Again! Blue Man Group On Tour Again! Rumors from my minions (thanks, Bob!) tells me that Blue Man Group is going on tour again! I’m happy because they are coming to Salt Lake City the day before Halloween! They’re giving me Halloween presents! Yeah! 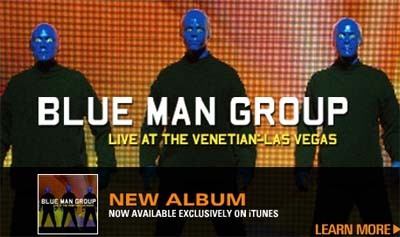 If you have never seen The Blue Man Group, you need to see this concert. If you HAVE seen The Blue Man Group, you need to see this concert, because I’m sure they have something totally new and unique planned for us! I’m going to see them at the Venetian next time we go to Las Vegas, so I’ll see if they are selling the album there or if it’s REALLY is an iTunes exclusive. I’ll keep you updated.